An Evening in the Round with Amy Grant, Vince Gill and Friends - SOLD OUT! The Beegie Adair Trio with Special Guest Monica Ramey - SOLD OUT! 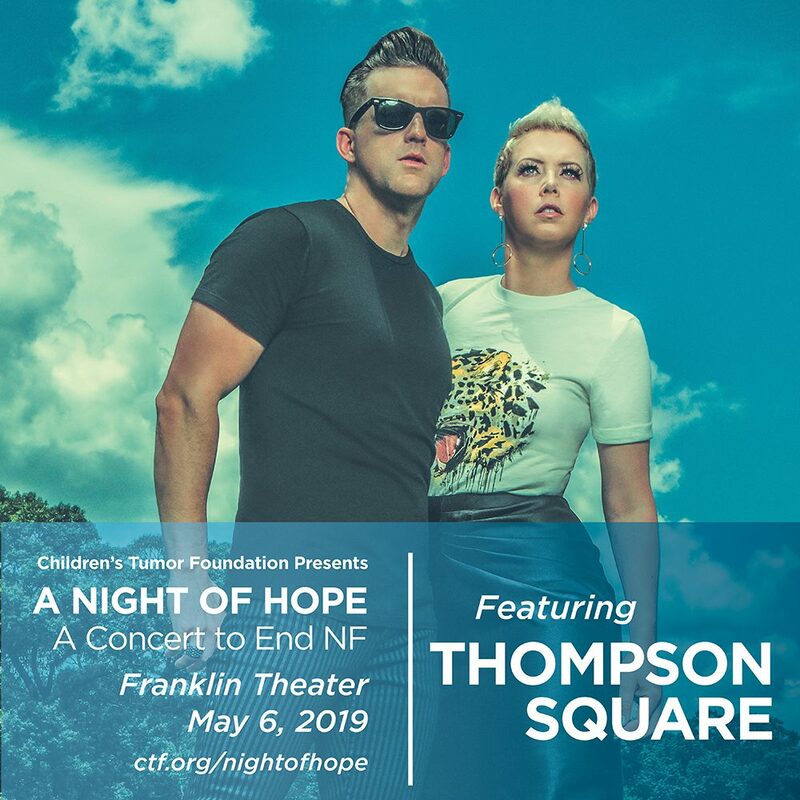 On Monday, May 6, 2019, GRAMMY-nominated, MULTI-PLATINUM Country duo Thompson Square will perform A Night of Hope: A Concert to End NF at the Franklin Theatre in Franklin, TN, to raise awareness and money for neurofibromatosis. Also known as NF, this rare genetic disorder causes tumors to grow on nerves throughout the body. It affects 1 in 3,000 people of all populations and there is no cure. Proceeds from the concert will benefit the Children’s Tumor Foundation the leader in the fight to end NF and a model for innovative research endeavors. Thompson Square is comprised of husband-and-wife team, Keifer and Shawna Thompson. Since breaking out in 2010 with their 2X-PLATINUM #1 smash “Are You Gonna Kiss Me Or Not,” the pair have gone on to score two Top 5 albums and another romantic #1 hit with PLATINUM-certified “If I Didn’t Have You” while also racking up multiple GRAMMY nominations and three trophies as Vocal Duo of the Year from the ACM and CMA Awards. Thompson Square’s third studio album, MASTERPIECE, is out now. “We’re honored to be performing at A Concert to End NF and helping to bring awareness to this devastating disease,” shared Keifer. Shawna adds, “Family is everything to us, and it means so much to be a part of something that is bringing the community together, making memories, and helping raise money for research.” The benefit concert takes place during NF Awareness Month, a month-long awareness campaign that includes online and offline events designed to educate the community about this under-recognized genetic disorder, and bring together those living with NF with their families, friends, the larger community, fundraisers and researchers. As part of the international Shine a Light on NF campaign, the Korean Way Veterans Memorial Bridge (Nashville, TN) will glow blue and green, joining hundreds of landmarks around the world. In prior years, former Governor Haslam has proclaimed the month of May as NF Awareness Month in Tennessee. (Photo credit: Garrett Merchant) “The Children’s Tumor Foundation is thankful that Thompson Square will perform this benefit concert during NF Awareness Month,” said Annette Bakker, PhD, Children’s Tumor Foundation President. “It takes many different ways of raising money and awareness to make an impact and drive research forward, and we’re ecstatic to have the support of Thompson Square.” Currently there is no cure for NF, but clinicians and scientists are optimistic that with funding for more research, actionable treatment options to improve the lives of the 2.5 million people living with NF will be attainable. WSMV-TV Features Reporter Terry Bulger will host the evening.